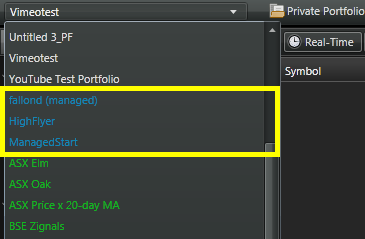 In addition to creating trading strategies with StrategyStudio, you can take a more hands-on approach by creating a managed portfolio using the Public Strategy feature of Portfolio. Whereas StrategyStudio strategy signal generation is fully automated, Public Strategies offer the manager full control of all signals generated and delivered to your subscribers. 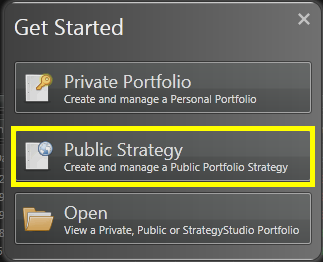 The first step is to select Public Strategy in Portfolio. The [Create] button will remain dimmed (non-selectable) until after you give your Public Strategy a name. Define the base currency and the Starting Capital. You can include a description and set your subscription charge, up to $100 a month. It will be possible to update your description at a later stage, although the subscription charge is set for the lifetime of the strategy. For now, accept the default 'No' for External Signals (this is for Excel and Metatrader based strategies) . After your strategy has been created, select it from the dropdown menu. All Public Strategies have blue text colour (StrategyStudio are in green and Private Portfolios are white text). Your Public Strategy is then ready for signals. 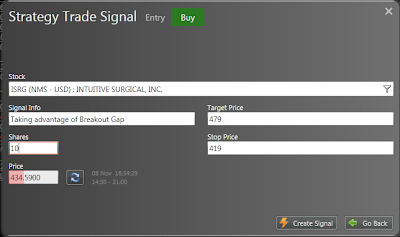 The menu bar has options to create a Private Portfolio, create another Public Strategy, enter a trade signal for your current Public Strategy, study graphical performance and returns for your Public Strategy, copy your positions - transactions - signals to an Excel spreadsheet, print your transactions, or access Help. 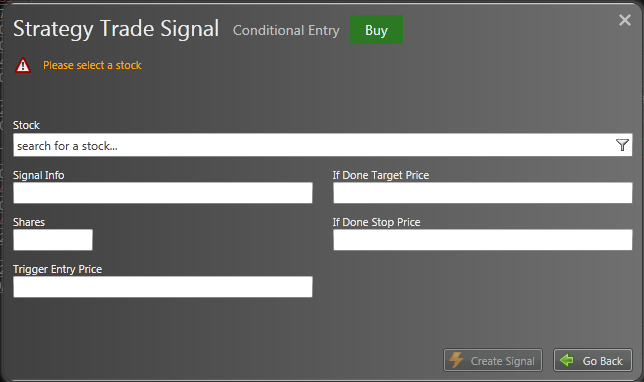 A Conditional Signal which can be set an any time and only triggers when the price conditions of the order are met. 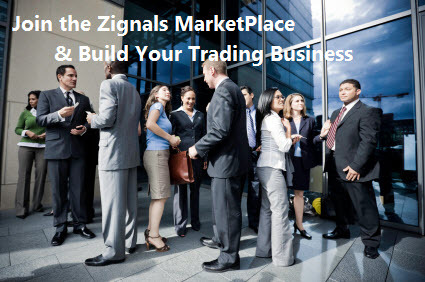 The simplest kind of Signal is one created during market hours. A confirmation dialog will ask if you wish to proceed with the Signal. Once confirmed the Signal will be delivered to all of your subscribers. A final message will confirm a Signal was Created. And in the Signals record log. 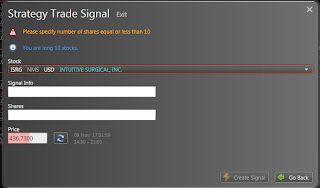 Your subscribers will have access to the same information in their Portfolio view (based from the time their subscription started; for example, in the above Portfolio, a subscriber joining after 9th February 2011 would not see a record of the earlier Signals). The trade dialog allows for the use of either a fixed or relative stop for signal orders entered outside market hours. Outside market hour trades will fill at the next open price. The open/fill price will be used to set the relative stop; for example, a purchase of a stock with an open price of $100 and a relative Target of 25% and a Stop of 10% will exit if the stock price reaches $90 (at stop) or $125 (at Target). Again, this Stop and Target Price can be adjusted after the trade is opened. 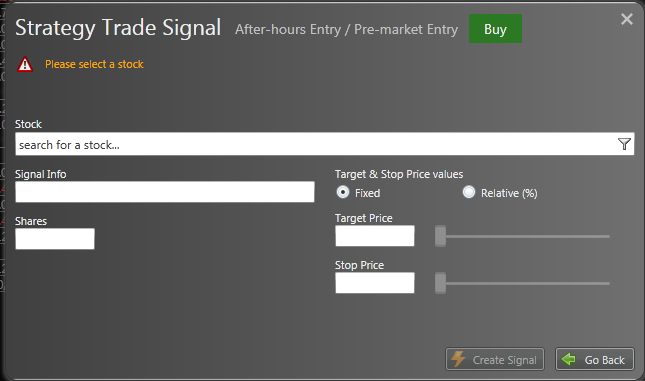 The final Signal type, the conditional order, allows you set the trigger Entry price - and if filled, the Target and Stop price to use. 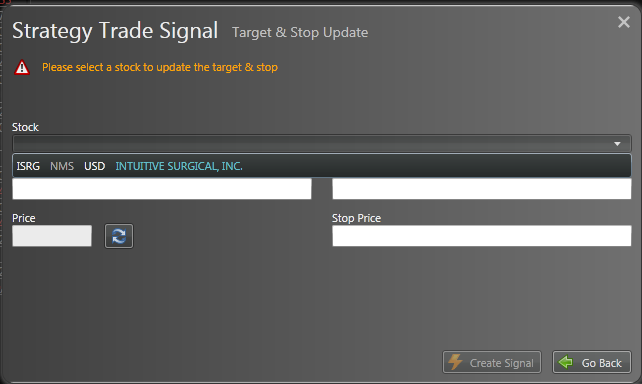 Over the course of the trade, Stop and Target prices can be updated. Existing positions will be displayed in a drop-down menu. The same selection process is used to Exit a trade prior to a Target or Stop been hit. It's possible to exit a partial position in this manner - the remainder of the position can be allowed exit when the Target of Stop is hit, or can be manually exited at a later date. 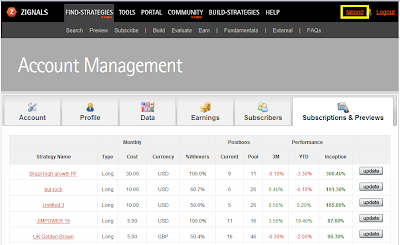 As the Portfolio builds up with trades you can use the Statistics and Performance metrics to study return. Potential subscribers will also have access to your Performance data to help them decide whether to follow or purchase your strategy. You can promote your Public Strategy from your Home Page. Your Home Page is available by clicking on the icon next to your user name OR by clicking 'My Page' under the Community tab. 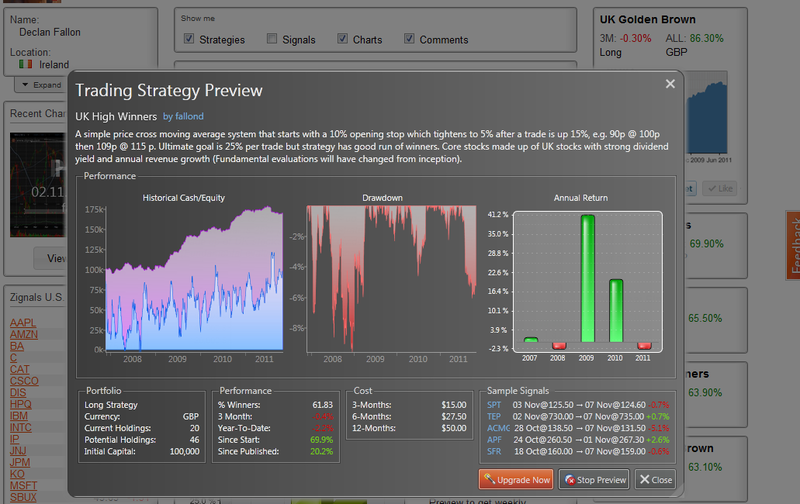 Strategies will be available on the right-hand-side with personal information, charts, watchlist and Twitter feed (if any) on the left. The center pane is taken up with Signals, Strategies, Charts and Comments. 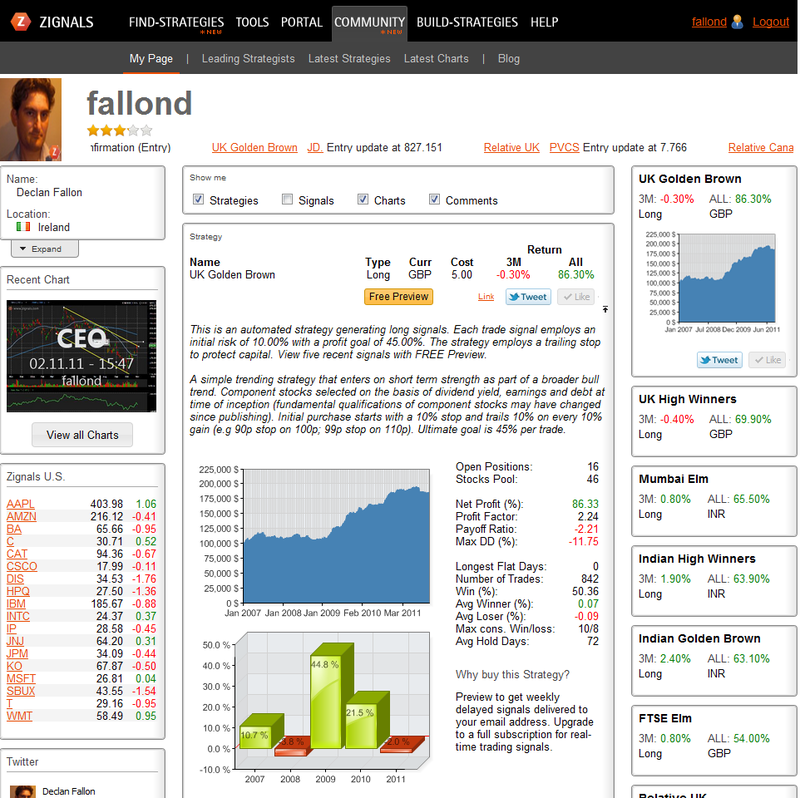 'fallond' will be the username of the owner, '#strategy193' will be the reference number for the strategy. This Home Page link can be shortened and shared on Facebook, Twitter, Blog or Forum. It could be used in an email signature too. 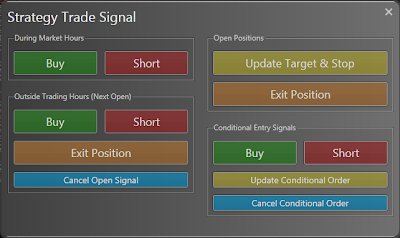 The [Free Preview] button allows any potential Subscriber follow a weekly summary of delayed Signals for free. If they wish to upgrade to real-time Signals they can do so at any time. Upgrades to real-time Signals earn the Public Strategy owner a 50:50 share of the subscription revenue. All free and paid-for subscriptions are managed from the Subscription & Previews tab of Account Management, located by clicking the user id link in the top-right. 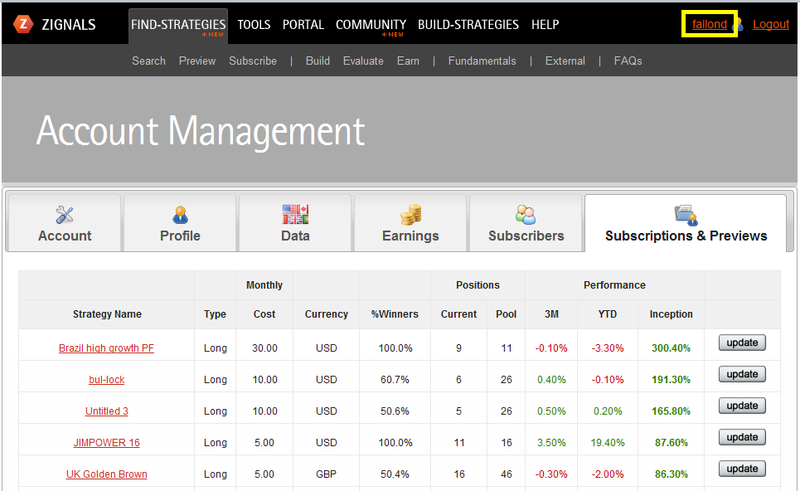 Public Strategies are Free to create and only require a no-cost Registration with Zignals to get started. Note: A Public Strategy can trade any instrument, including Forex, as available in our global data. Trades of foreign stocks will have an end-of-day FX rate applied to the transaction to convert it to the Portfolio's base currency.